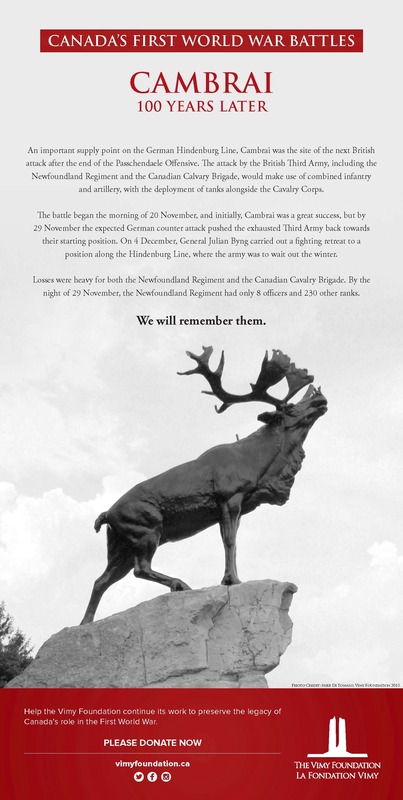 On this day in 1917 (20 November), the Royal Newfoundland Regiment and Canadian Cavalry Brigade take part in the launch of the massive Commonwealth attack on Cambrai. Labelled “The Great Experiment”, the attack foregoes the typical artillery bombardment, and instead relies on advanced surveying and range-finding to launch a sudden furious barrage at the hour of attack. Trundling into this are nearly 300 tanks, followed by infantry deploying aggressive fire and movement tactics. The next major offensive on the Western Front was now underway. Like the Canadian Corps, the Newfoundland Regiment had fought at Passchendaele in the fall of 1917. After only a short rest period the Regiment was sent back to France near the town of Cambrai. An important supply point on the German Hindenburg Line, Cambrai was the site of the next British attack after the end of Haig’s long and draining Passchendaele Offensive. The attack by the British Third Army, organised by General Julian Byng of Vimy fame, would make use of combined infantry and artillery, with the second major deployment of Haig’s mystery weapon of 1916 – the tank – alongside the Cavalry Corps. 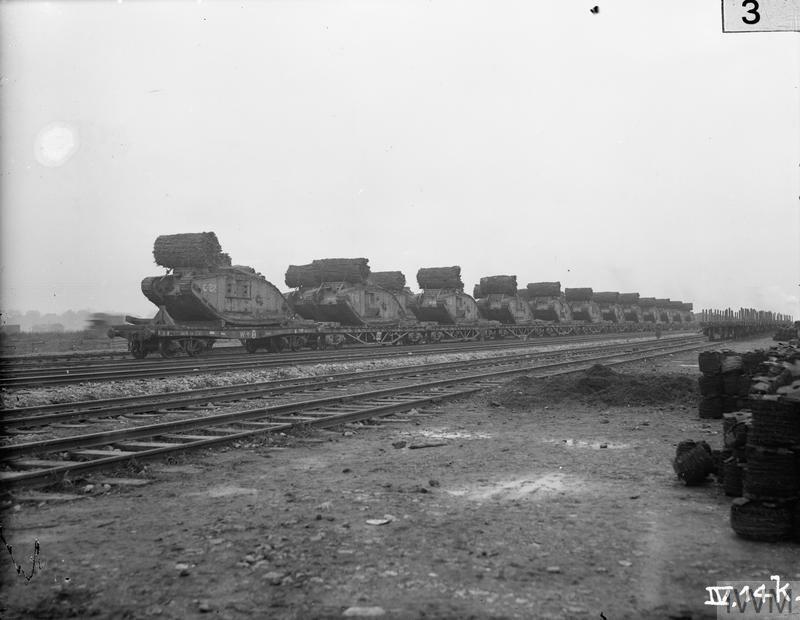 Now in sufficient numbers to be massed together, over 200 tanks were to be used to break the Hindenberg Line. Launched early in the morning, the massed artillery, machine guns, and tanks quickly overwhelmed the German frontline positions. Placed in a follow-up wave, the Newfoundland Regiment pressed forward with the other units of the 88th Brigade. Meanwhile the Canadian Cavalry Brigade (CCB) waited for the opportunity to attack across the open ground that was to be cleared by the infantry. Initially, Cambrai was a great success. The British Army advanced further in one day than the entire Passchendaele campaign, and everything seemed to be going well until the first German counter-attack. Unfortunately, the CCB was stuck until mid-afternoon on 20 November waiting for an improvised bridge to be constructed for their horses, and the Third Army had almost no reserves. This weakness began to show as the battle dragged on, and on 29 November the expected German counter-attack pushed the exhausted Third Army back towards their starting position. On 4 December, Byng carried out a fighting retreat to a position along the Hindenburg Line, where the army was to wait out the winter. Losses were heavy for both the Newfoundland Regiment and the Canadian Cavalry Brigade; total Third Army losses were over 40 000 killed, wounded and missing. By the night of November 29, the Newfoundland Regiment had only 8 officers and 230 other ranks left. The Battle of Cambrai lasts from 20 November – 7 December 1917. -General Byng attempted the combination of artillery, infantry, tanks, and mobile cavalry that would be so successful during the Hundred Days Offensive in 1918. There were a lot of moving parts, and not all of them worked as they should, particularly the tanks and cavalry; however, Byng realised that combined attacks were what would win the war. -The initial attack marked the first use of tanks en masse, with over 200 from the newly formed Tank Corps functioning as an independent unit in coordination with the infantry, rather than suborned to it. -The artillery approach at Cambrai was reconfigured, with no preliminary registering of the guns other than survey calculations. As a result, the creeping barrage opened up with no prior warning, gaining surprise, but at the loss of accuracy. The infantry was to advance behind the tanks, which was supposed to protect them from accidental friendly fire. The courage and sacrifice displayed by the Newfoundlanders during the Cambrai offensive resulted in a number of medals and awards being awarded to individual members of the Regiment. A member of the Canadian Cavalry Brigade also received the Victoria Cross. Please click on the hyperlinks in the men’s names for further reading about their lives and actions at Cambrai in 1917. Lance Corporal John Shiwak, was an Inuk from Rigolet, Labrador and one of the Newfoundland Regiment’s snipers. He was killed on 20 November 1917, by a direct hit from a German shell that killed nine other men. Shiwak corresponded with the journalist William Lacey Amy, who had encouraged him to keep a diary while at the front. Lieutenant Harcus Strachan, VC, MC, served with the Fort Garry Horse, and received a Victoria Cross after leading “B” Squadron through the enemy lines when their Captain was killed, eliminating an enemy field gun battery and numerous infantry parties along the way. Strachan survived the war and returned to Alberta where he lived until his death in 1982. Download our poster about the centennial anniversary of Cambrai.